May always starts with something of a bang, with various events marking May Day, including the annual march which has celebrated the day in London for around 40 years, but also with other groups organising their own events to mark the day. This year after the march I went to a protest by Campaign4Justice and Merlin Emmanuel outside the offices of the IPCC calling for its abolition for its failure to investigate police actions and then caught up with a group who were roaming central London protesting against shops using free labour with unemployed people given the ‘choice’ of working for nothing or losing their benefits. Among those taking part in this ‘workfare’ protest were a group from Occupy London, and in the early evening after the police who had been following them all apparently went off shift walked up into the City and finally reached their original objective back in October 2011, the London Stock Exchange. I’d been there back in October 2011 when a general meeting at Westminster at the end of the Block the Bridge NHS Protest had voted to occupy the Stock Exchange, and outside with them the following Saturday when police blocked their access to the private Paternoster Square where is is situated, and on the steps of St Paul’s Cathedral when they came to the decision to camp there instead. 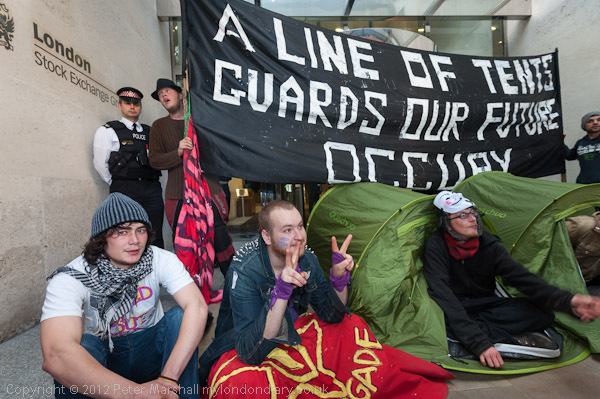 So I was pleased to be one of the small handful of photographers who was actually with them when a small group finally made their objective and set up tents in the doorway of the London Stock Exchange, even if we all knew it was only a token gesture. After a few minutes they were made to move a few yards away, and by the time the word got out and more police, photographers and press arrived the moment had gone, although the protesters were kettled in the square for some hours, long after I’d filed my story and gone to bed. Again I needed the 16mm, and perhaps something even a little wider would have done the job even better – it could have been better with the whole of the design at top left and more of the second tent and person holding the banner at right. There were too many people milling around to work from further away. The light was pretty dim and I had to use flash. The banner was only in position for a fairly short time and I was pleased to have managed to get its message and the sign for the London Stock Exchange in the picture above the line of seated protesters and the two tents. More pictures from the event at Stock Exchange Occupied. On 10 May there was a one-day strike by public sector workers over the raising of the retirement age and worsening of pension provisions as well as cuts in services. 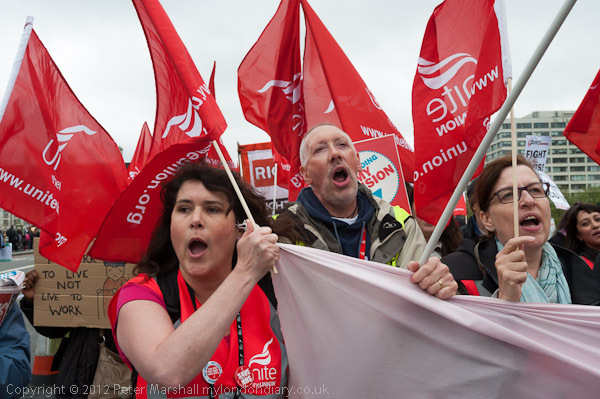 Many workers feel the trade unions have been slow to take action against the cuts and the austerity programme, including the attacks on the NHS, and the strength of feeling was shown in votes such as the 94% of Unite’s NHS members who voted for this day of action. This was a picture that I hope shows some of that strength of feeling and unity, with three of those holding the union banner shouting in unison, and the Unite flags flying behind them as they came over Westminster Bridge at the head of the march from St Thomas’s Hospital behind them at right of the picture. But my favourite among the fringe demonstrators was a ‘professional protest stall’ manned by the Space Hijackers, with advice on suitable placards and chants for the protest. I wanted to show some of these, along with the police march. Many of the police were obviously amused as they marched past, but the display did offend others, and I was present when police not taking part in the march threatened the Hijackers with arrest, particularly if they displayed a poster with the acronym ACAB on it, which you can also see on the peak of the cap being worn by the masked protester. Shortly after I took this image, a line of police came and stood between the stall and the march in an attempt to hide it from view. I spent quite a lot of time talking to people and perhaps didn’t concentrate on taking pictures as much as in earlier years, but you can see the other pictures in London Crowns 100th May Queen. 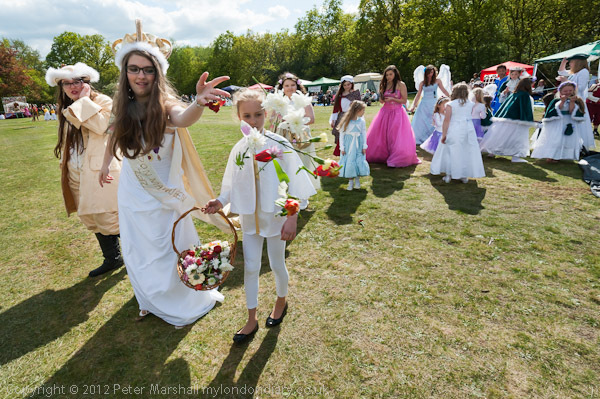 One of the hardest things to photograph is the procession of the May Queen around the arena near the end of the event, when she scatters flowers to the children in the various May Queen realms seated around the outside. The picture captures this, with a rather large bunch of them in mid-air having just left her hand. I was fairly close – again with the lens at 16mm – but of course having to keep out of the way of the flowers and the children seated on the ground who they were being thrown towards. This was taken at 1/800s, fast enough to freeze the action, although the flowers are not quite sharp probably because they are out of focus. I wanted to get all of the procession sharp, and depth of field even on a well stopped-down 16mm has its limits. I’d decided not to use flash even though it would have helped with the nearer figures – as you can see I was working more or less directly into the sun – but to use a little post-processing to lighten these shadow areas. Any useful amount of flash would almost certainly had burnt out the very close flowers. I’ve chosen two pictures from No To NATO, Troops Out Of Afghanistan in front of the US Embassy in Grosvenor Square on May 19. 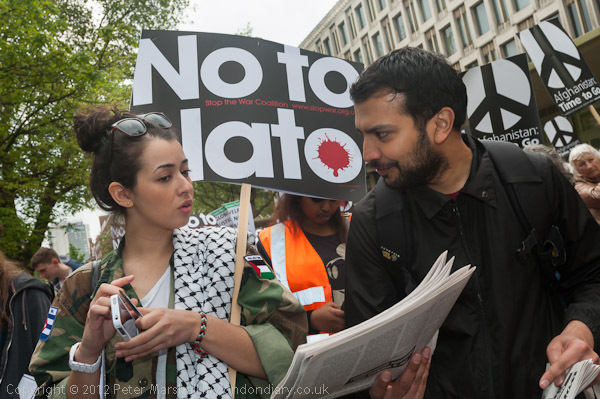 One shows a left-wing newspaper seller talking with one of the protesters in the crowd holding placards in front of the embassy. The newspaper looks like the ‘Workers Hammer’ published by the Trotskyist Spartacist League. I don’t know if anyone ever does buy it, and though I’ve on occasion been given a free issue I’ve seldom found much of it worth reading. Like most of my work, this was taken with the 16-35mm, but this at the long end of the zoom. It is I think all about gesture and expression, and about the kind of things that go on in the crowd at demonstrations, although I’m not sure it is all about selling newspapers. My final selection from May was of one of the speakers at the same event. There were an interminable number of them, and after an hour or so my attention had rather drained away. But this speaker was different, because he came accompanied with flags. The flag at bottom left was fairly static but the one behind the speaker was being waved fairly vigorously on a long pole. 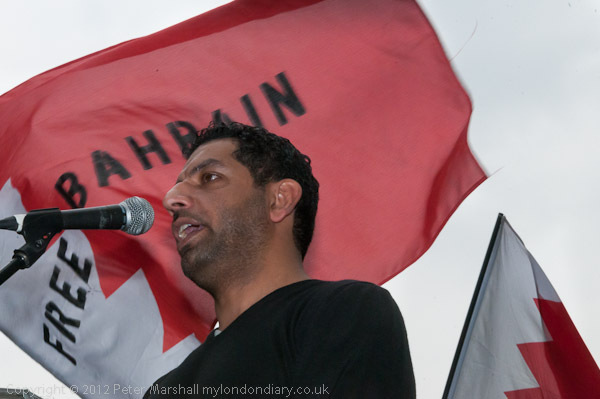 There was no wind to make a flag fly, but photographing this speaker and the flag was something of a challenge and I think the result is reasonably striking. Certainly it stands out against the probably 30 or so attempts I made, most of which where more or less immediately deleted . June’s selection will follow shortly. This entry was posted on Thursday, December 27th, 2012 at 06:53 pm and is filed under My Own Work, Photo Issues, Political Issues. You can follow any responses to this entry through the RSS 2.0 feed. You can leave a response, or trackback from your own site.